When it come down to solid surface, Earth dominates the solar system. When we think about our solar system, most of our minds likely wander to Jupiter’s immensely large storm or Saturn’s fantastical rings. Perhaps some picture Neptune’s deep blue hue or its sea of liquid diamond. The point being, these huge objects capture our imagination because they are so far-flung from Earthly sights, like our planet’s rolling seas of blue and green and the rocks that crunch beneath our shoes. We kind of overlook the fact that the vast majority of planets are composed almost entirely of gas, including those in our solar system. 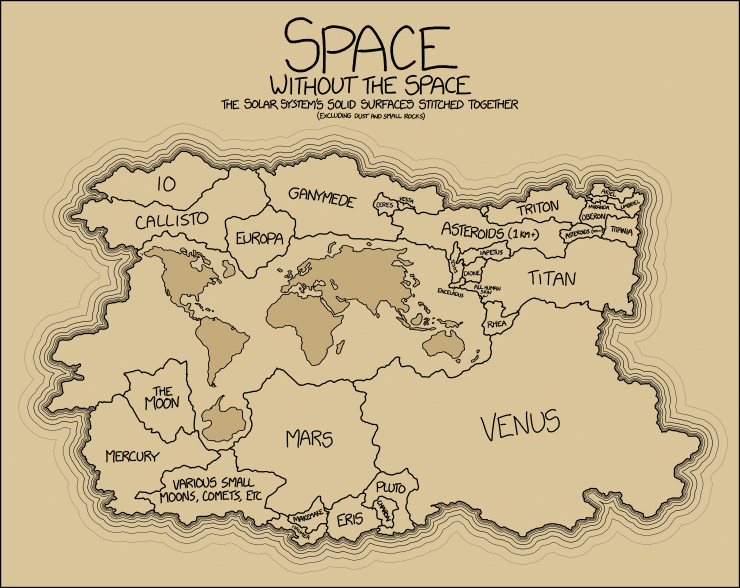 XKCD’s Randall Munroe drives this point home in an illustration titled “Space Without the Space.” Munroe stitched together an old-school, pirate-esque map that shows all of the solid surface in our solar system (excluding speculative estimates on the solid “ground” that may lurk deep within the cores of gas giants). Earth clearly contributes the most area to the map, though it’s unclear as to how Munroe incorporated Earth’s oceans (the surface beneath them, specifically) into the graphic. Venus comes in at a close second, which isn’t surprising since it’s very similar to Earth in size. Then we have the other rocky bodies: Mercury and Mars. What might be surprising to some is just how similar in size the planets and moons truly are. Three out of four of the Galilean moons (Callisto, Ganymede, and Io) make up a considerable portion of the map. Ganymede, in particular, is the most noteworthy. Believe it or not, it’s actually a bit larger than Mercury (it’s not that much smaller than Mars, for that matter). It even appears as if all of the dwarf planets (pictured near the bottom) could fit inside any of the three largest Galilean moons. It’s also neat that Monroe grouped asteroids, comets, and other small planetoids together as they contribute a small, but discernible fraction of our solar system’s rock. I’m not sure which point of view is cooler: the fact that there are so many of these objects scattered throughout our solar system that, together, they are the same size as a small moon or that objects so numerous (there are billions, perhaps even trillions, of them) could be so small that all of them combined only add up to the size of a small moon. I’ll leave that one up to you. Despite how vastly different they are in size and composition, terrestrial planets and gaseous ones form in a strikingly similar manner (at least we think so). Based on our most current model, it’s understood that our solar system — along with all of the other planetary systems we’ve found circling distant “Suns” — formed following the collapse of a nebular cloud. From there, it’s understood that once a newly born star emerges from its cocoon, an elliptical disk of material, called a protoplanetary disk, encircles the young star. The disk is composed of a variety of materials, including ice, water-ice, rock, grains, and some heavier elements (iron, nickel, gold, etc. ), but gas is by far the most prevalent type of material. Within the chaotic, spinning disks, the materials collide and start to coalesce into a planet. After enough of the materials gather, gravity takes over and helps transform the oddly shaped planetesimals into the spherical planets we all know and love. Of course, the concentration and quantity of the materials dictates what a planet will be made of and the number of them that will form in a solar system. However, a different mechanism — one occurring much farther out within the disk — eventually starts to influence the proto-planets. After hundreds of millions of years of slow accretion, all at once, the proto-planets start accreting gaseous envelopes (like an atmosphere). The growth can be stanched by stellar phenomena (like solar winds), but these effects are diluted over vast distances, thus allowing the more distant planets to keep on growing until they are more gas than rock. At such distances, the temperatures also drop off, eventually becoming so cold that even gas itself freezes. The newly acquired mass allows the large bodies to capture the frozen gas and become even more immense, until the planets become full-blown gas giants.